Cape Town - Bidvest Wits and Bafana Bafana star Darren Keet says he would not consider joining Mamelodi Sundowns even if a R1 million-a-month salary was on offer. Keet is the talk of the town in South African football at the moment after his superb individual performance in last Sunday's 2-1 victory over Libya. The result ensured that Bafana have qualified for the upcoming Africa Cup of Nations tournament set to take place in Egypt during June and July. Nonetheless, the 29-year-old's future is in doubt as his deal with the Clever Boys expires at the end of the current campaign. Reports suggest the player is seeking a return to Europe though the player insists that if he doesn't move abroad again, he would be happy to remain with coach Gavin Hunt's side. When asked by a journalist if he'd accept R1 million-a-month to move the Brazilians, he answered: "There's no reason for me to leave and any money any other club can offer, Wits can pay me also. "So it's not even about the money, it's not about anything for me. "We've got more chances of winning the league (at Wits) than at other teams, so there's no reason for me to even bother or want to leave. "Obviously there's talk and there's always going to be an interest in players around South Africa and it's no different for me. "My contract is coming to an end and if a player is free it makes it easier for a club because they don't have to pay the transfer fees and things like that. "No I'm not going to do things like that (joining Sundowns). I'm not looking to join any club in South Africa. 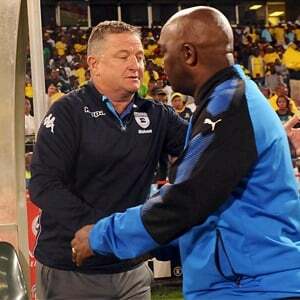 "If there's no overseas club I will stay at Wits. Like I said, there's no better place for me than right here. "My family is happy, the club likes me and I like the club."